Last month, along with friends from the Salt Lake Dream Team and Occupy Sandy, I went to the Pine Ridge Reservation (also known as Prisoner of War Camp #344), that is home to the Oglala Lakota Nation… and for that time, we left US territory. Coming back to occupied lands, to the oppressive ticking of Time, to the machine that expects me to consume, produce, consume, to no end has been an uncomfortable transition. On our way to Pine Ridge, we stopped in so-called Montana for a Moccasins on the Ground training , hosted by Indian People’s Action. There, we were greeted by the powerful spirit of Winona LaDuke, urging us to think about the long haul, to get some perspective, and to fight back without internalizing the system’s angers. Meanwhile, Debra White Plume, grand-mother and leader of her people, looked upon the men, compassionately, knowingly, reminding them of how hard they have to work to live up to women, the bearers of life. Amidst ceremony and drum circles, we shared meals, sat with one another, as many walks of life converged in stories about coal plants, uranium mines, tar sands extraction, oil pipelines, mass incarcerations, broken treaties and the battle for sovereignty. This interconnectedness is what should define our climate justice analysis and actions. To truly win, land and justice defenders must recognize overlapping systems of oppression within this capitalist culture, and take cues from the communities most impacted by colonization, militarism, and poverty. The Lakota who welcomed us into their home and into their lives, who trusted us to stand beside them as allies, are survivors. I’m not talking about survival as a passive act, but as an act of daily resistance to over 500 years of exploitation, assimilation and genocide. It’s a testament to the resilience of their spirit, culture, and ways of life. One of the poorest nations in the Western Hemisphere, Pine Ridge cannot be merely reduced to its economics, its unemployment rate of roughly 80%, its disproportionately high teenage suicide rates, its public hospitals staffed by doctors-in-training, nor its alcohol-related court cases and deaths – all violent inflictions of poverty. Because the nation’s heart beats through its people, still standing as keepers of the land, through the knowledge and wisdom of their elders, the sacredness of their language, the leadership of their women, and the laughter of their children. Before entering the small town of White Clay, in so-called Nebraska, I had been warned about the energy vortex, the physical sickness that often takes over one’s body from just being there. 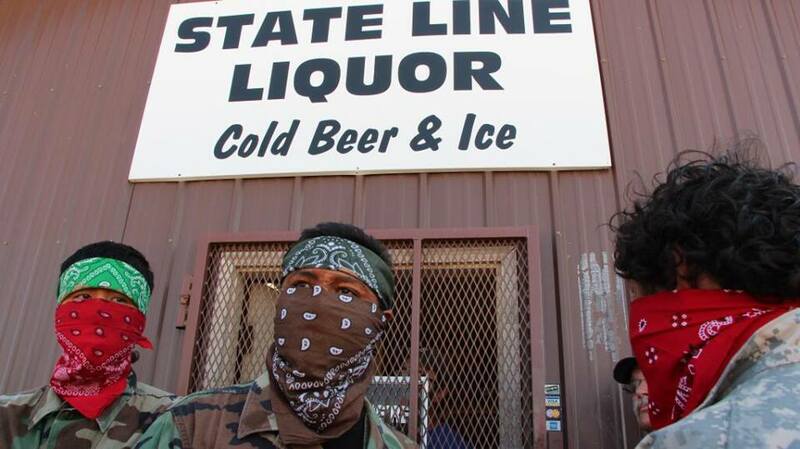 Less than 200 feet from the dry Pine Ridge Indian Reservation, this town of 12 has one sole purpose: to sell alcohol to natives, to the tune of $4 million in annual sales. And for years, people have been fighting back, resisting what has been coined liquid genocide, waging a war against the beer companies making shameful profits which come at the cost of human trafficking, sexual violence, and other forms of abuse. 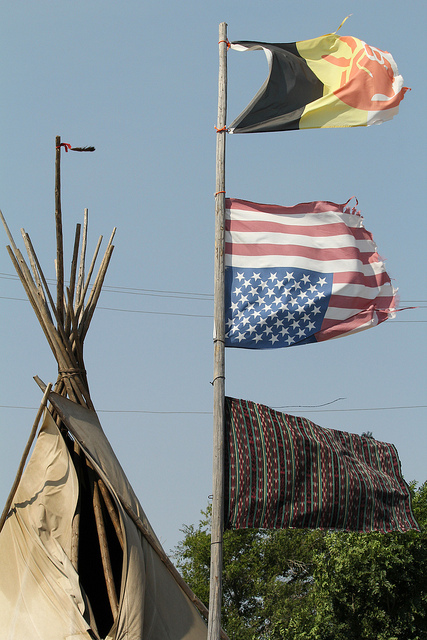 And the Lakota resistance won’t stop until the town shuts down! 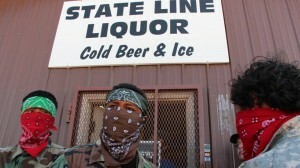 Until the white bar owners stop enticing natives to drink themselves to death, when many of them turn to alcohol to cope with the historical traumas they carry in their bodies. Until the police force stops protecting the financial interests of mega-corporations, turning a blind eye to the bar owners paying off intoxicated folks, in an effort to pit them against their own family members. The truth is that there are many White Clays, on the borders of too many native sovereign nations, where this liquid genocide is perpetuated, away from the public eye. So we cried out. We stood with the Oglala Warriors in their struggle. We took part in a march led by women, which culminated in stories of what alcohol has done to their people, the abuses as well as the success stories of those who have sobered up and joined the ranks of the struggle. Days later, allies and warriors joined to take direct action – shutting down stores, turning back beer trucks, and holding back the police line that threatened us with pepper spray and assault. And then we went home, showered with blessings for our journeys. Now hundreds of miles away, I wonder what it means to keep their struggle alive, for myself, for you, for our communities. When we’re invited as allies to front lines of struggle foreign to us, into people’s homes and realities that many of us can walk away from, there are unspoken codes of honor. In how we raise our voices with those of warriors, how we call out present-day genocide and dismantle mainstream narratives that colonization is a distant memory, a thing of the past. In how we speak about it, as outsiders, sifting through our own experiences, when many of the stories are not for us to share. Indigenous Nations have been fighting back for over 500 years on this continent. They have been confronting governments, calling out ethnic cleansing, broken treaties and promised, involuntary sterilization and the theft of their children, all the while reminding us that the land does not belong to us, we belong to it. Yet, as non-natives, our analysis has often lacked depth and integrity to the interconnectedness of our struggles. When sovereignty rights have everything to do with land defense and collective liberation, it’s time we hear the rallying cry. Time to step it up in how we decolonize our minds, and how we carry out the struggle. Instead of walking away when the going gets tough, this moment calls upon us to stand our ground and learn to manifest what genuine solidarity to the frontlines looks like. Fuerza!